Faculty members can now specify if links to attachments within personal vitas should be visible or hidden. This is applicable to all sections within a vita. Select a personal vita to edit, or create a new vita. In the General Information section, select the desired link behavior using the Hide Attachments on Vita option. 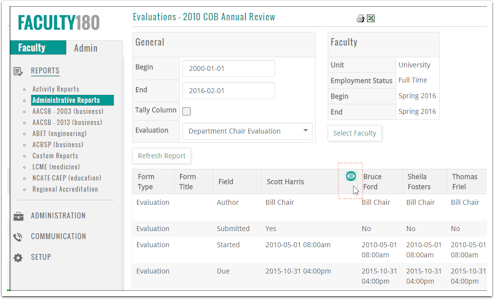 Columns can now be temporarily hidden on the Evaluation Details Report and the Evaluation Faculty Process Details Report to make the reports easier to view. In the Administrative Reports section, click Evaluations. The Evaluations screen displays. Click the Totals link for Evaluation Titles or Faculty Being Evaluated, then continue to drill down in the report. Click the icon to hide the column. To display any hidden columns, click Show Hidden Columns at the bottom of the screen. Faculty members can now view the most recent CCV that was imported into FACULTY180. The CCV can then be printed, if necessary, using the available printing options in the browser. Click View Previous CCV Import. The previously imported sections display. A new administrative right for manually adding faculty members to FACULTY180 has been added to the Organizational Structure functionality. This allows institutions to specify which subunits can manually add faculty members to FACULTY180. Subunits can also be restricted from manually adding faculty members. Click Organizational Structure in the School section. Click the Edit icon adjacent to the subunit that you wish to define the administrative right. The Edit Subunit screen displays. In the Administrative Rights section, specify the access level for the Manage Faculty: Add Faculty option.